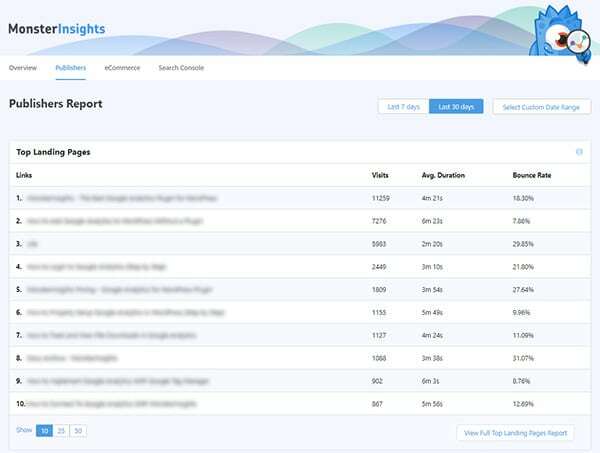 Last year, we acquired the best Google Analytics plugin for WordPress, renamed it to MonsterInsights, and rewrote it from the ground up. As we mentioned in the announcement for MonsterInsights 6.0, that rewrite was necessary in part so we could make room for all the new features that we wanted to add. Now that those tracking features are in place, we’re ready to enter Phase 2… actionable analytics reports right in your WordPress dashboard. 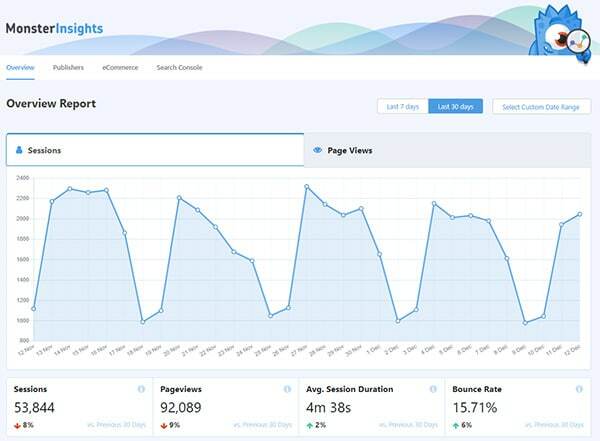 With the new and improved MonsterInsights dashboard, you can see at a glance the info you need to make data-driven decisions to grow your site. Now you’ll see your sessions as well as page views, plus your average session duration and bounce rate, top referral sources, and top pages. Together, all these numbers give you a snapshot view of not only how much traffic you’re getting, but how engaged your visitors are. In addition, you’ll notice the new date options. The default view is still 30 days, but you can also view the last 7 days at a click, or enter your own custom date range. Not only that… we’ve also made significant performance improvements to the admin area, both in terms of speed and the significant reduction in memory used. We’ve also put together a Publisher Report and an eCommerce Report. Now you’ll be able to click on the Publishers tab right from your MonsterInsights dashboard to get the insights you need. 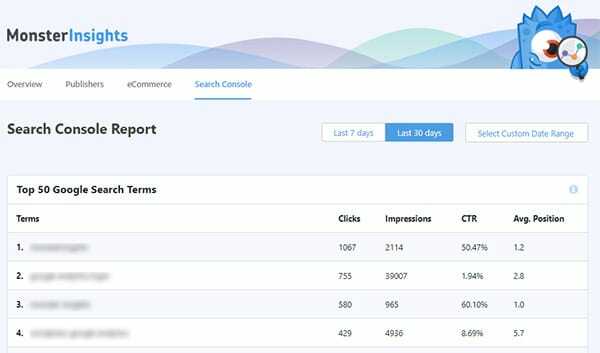 At the top you’ll see a report of your top 10 landing pages, exit pages, even your top download links and affiliate links. Then there’s even a demographics and interests report below that. This report will give you all the crucial data you need to understand your audience and their behavior on your site. You’ll be able to see what’s working and what’s not, so you can optimize your monetization strategy for maximum earnings. As an eCommerce site owner, you have different needs than publishers. In Phase 1 our goal was to make sure you were gathering all the data you needed to, including making it as easy as possible to enable enhanced eCommerce tracking in Google Analytics. With MonsterInsights 7.0, now we’re putting all that data right at your fingertips. 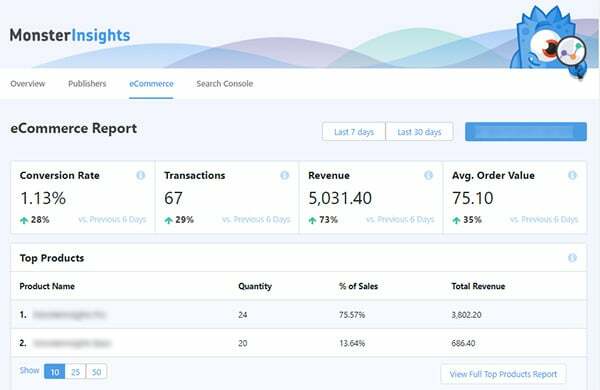 In the new eCommerce report, you’ll see all the crucial eCommerce metrics you need at a glance: your conversion rate, transactions, revenue, and average order value, and much more. You can scroll down to understand just where your traffic is coming from, with your top referral sources and the exact conversions and revenue they’re sending your way. Now you’ll know which referral sources to maximize, and which just aren’t working out. 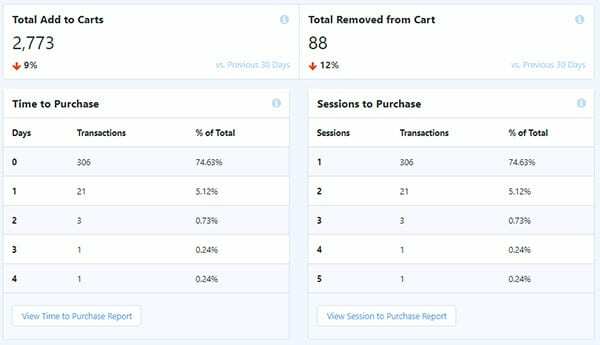 Below that, you’ll see stats to help you understand your user’s behavior on your site, including total added and removed from carts, and times and sessions to purchase. We’ve also added a Search Console report so you can measure your SEO performance right in your WordPress dashboard, while you’re working on your content. Reporting isn’t the only thing new. We’re also adding the ability to use Google authentication at the network level. The new process will no longer require copy and pasting any code, allowing for a more streamlined and faster process. Setting up Google Analytics on a WordPress Multisite network will also be much easier. For networked WordPress sites, you can now set it up at the network panel level and use those credentials as the default ones for reporting on all your subsites, saving you a ton of time. We’re not stopping at Publisher and eCommerce reports. With this update, we can now easily and much more quickly add more reporting and long requested features. In a nutshell, our long-term focus is on bringing easy-to-digest, actionable insights directly to you within the WordPress dashboard, and this update is only the first step. We’ll be continuing to add new reports and expand the broadness and depth of detail of the reports as we move forward. We’re incredibly excited to be finalizing MonsterInsights 7.0 for release. Although we haven’t set an exact date yet, it’s coming very soon! Keep an eye on your WordPress dashboard for your update prompt. If you have any questions, please feel free to get in touch using our contact form or leave a comment here. I want to thank all of you, our customers. The growth that MonsterInsights is seeing wouldn’t be possible without all of your support and feedback. We look forward to helping you get the actionable analytics you need to grow your WordPress site!